Here is a nice looking large size Rosenbaums that should be eastern because of the dot on the base and the tapered top. I have a hard time believing that all dot based large size Rosenbaums are eastern blown. The color and character is spot on for early western glass and doesn't the top remind you of a Simons or Von Humodlts ? 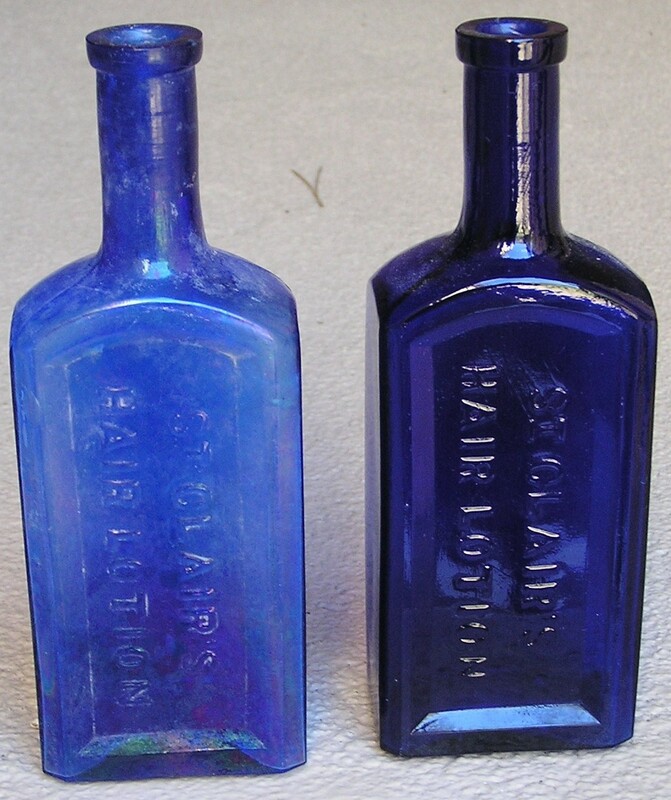 Here is 2 Different St. Clair's Hair Lotions, the darker one is what I have seen as Typical, the Lighter color ones I have not seen a lot of, its also got a nice Benicia Effect to it, is Cruder, The lighter one is 1/8" taller, Embossing Looks the same on both, Kind of like the one Lou posted, His looks like an Applied Top, these both are Tool Tops. Howard St. Clair Chemist Boston, Mass. Hope all is well your way. The rain here has been unbelievable. Here’s a pic of the only Western version of this bottle that I’ve seen. Just wondering if anyone has heard about any dates for a Reno, NV Show ? 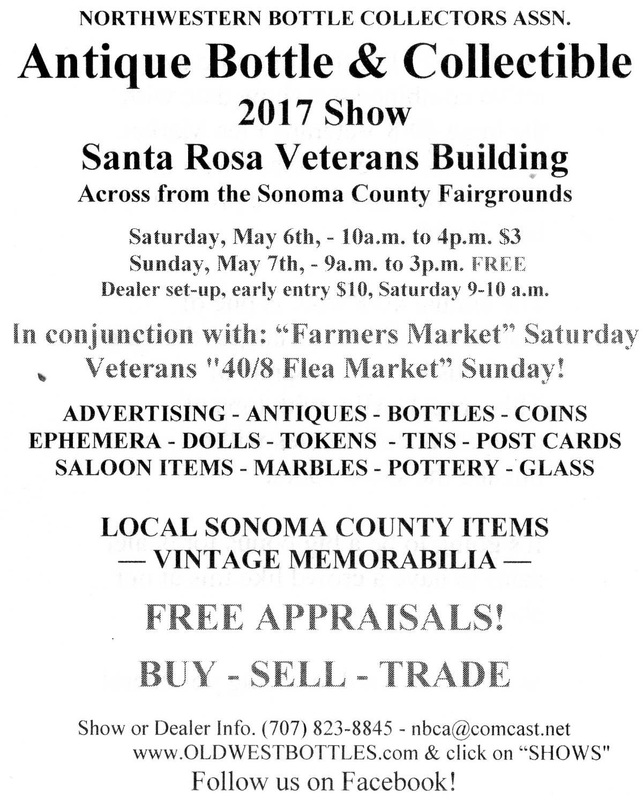 Update: The Santa Rosa Antique Bottle & Collectibles show will be held on May 6th & 7th, 2017. The first weekend in May will now continue to be our annual date. Our venue had a change in staff who inadvertently sold our original 2017 date we had booked a year in advance. Unknown to us, we had flyers printed with the wrong dates and distributed at the Downieville show. With much apology from the Hall director, we were asked what they could do to make up for their screw-up. Finally they granted us the show date we’ve always wanted and always denied due to the other huge event at the venue. The 40/8 Flea Market is attended by hundreds if not thousands of people and is also on this first weekend. It’s not to be confused with the regular weekly flea mkt. we’ve held our show with in the past. 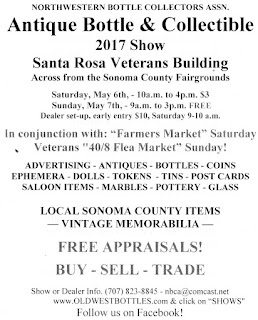 This is one of the biggest annual flea markets in Northern California with loads of antiques & collectibles. It’s draws a large amount of both collectors and dealers from all over. Then on Saturday it’s the “Farmers” Mkt.” which will also be just outside our show doors. This is an unbelievable venue for a bottle show, we will have lots of visitors. It was with much discussion among club members and voted upon to select this date. 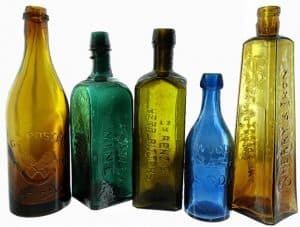 As we look around there’s fewer bottle collectors as the years go by. Attendance at shows is down and 2nd days are often a little to quiet. 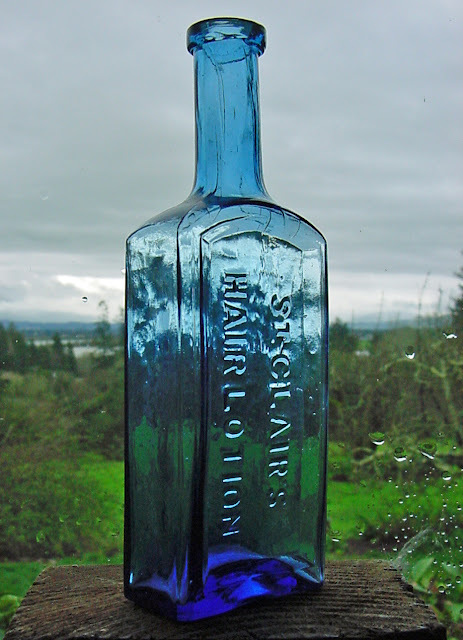 It’s important to get the general public exposed to the hobby and generate new collectors. Holding shows with like events is a benefit for dealer sales and a great way to generate new collectors. 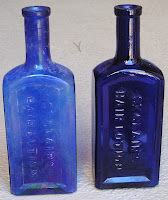 Follow the “Northwestern Bottle Collectors Association” at: https://www.facebook.com/NBCA1965/ on Facebook! 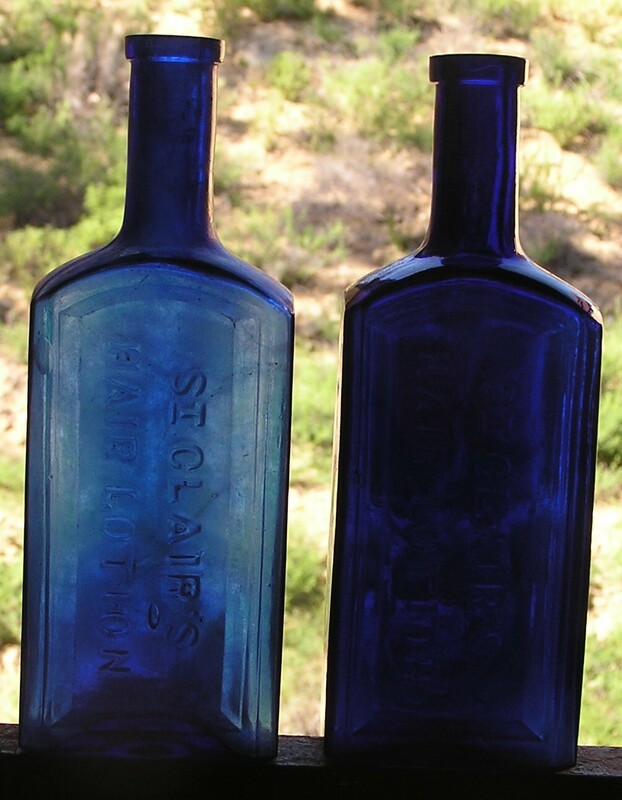 American Bottle Auctions – Auction 63 is Now Open for Bidding! 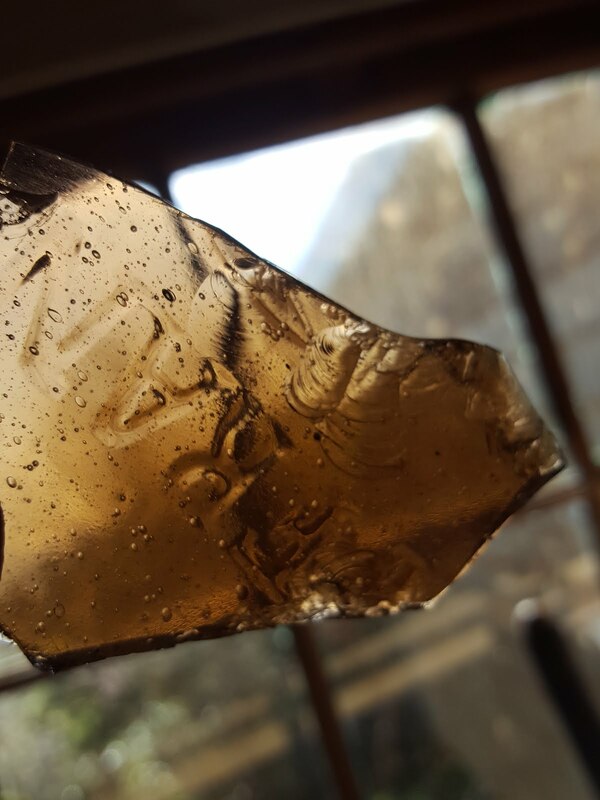 Part One is Underway. The first of our two-part Madruga/O’Neill western auction is open for viewing and bidding starts today! Part one is open for bidding up until Sunday February 19th and part two will start on March 1 and end on March 19th. We’ve extended the bidding period for both parts of the auction so that everyone will have enough time to check it out. If you have any questions please let us know and we’ll be happy to answer them or simply email us and request extra photos or even a video and we can get them to you right away. Requested catalogs are being printed and will be in the mail tomorrow. 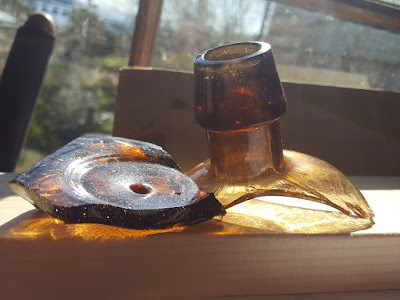 Thank you for taking the time to check the auction out. We truly have the best customers in the world!